LotaData transforms anonymized mobile geo-temporal data into historical situational context and real-time insights about people presence, activity and movement. Our AI platform discovers the influence and impact of the physical environment and offers meaningful insights into how people interact with the real world. LotaData's GeoGraph platform integrates with thousands of reliable mobile data sources using APIs and our lightweight energy efficient mobile SDK. Our AI correlates trillions of anonymized mobile geo-temporal data signals with our first party geospatial data about local places, brands, venues, events, crime, neighborhood ambience, demographics, income, housing, education, employment, and weather. CityDash AI analyzes 1000 cities to create a real-world knowledge graph for the public sector. The self-serve map-based visual dashboard combines public and private datasets to provide accurate and anonymized People Intelligence™, enabling government leaders to create social impact. CityDash AI is an essential service for agencies that are responsible for economic development, urban planning, mobility, transportation, smart assets, public safety, law enforcement, 311 customer service, parks, recreation programs, and city events. Meticulously curated GIS shapes, blocks, buildings, neighborhoods, crime, demographics, 311 records, and weather patterns. Fresh, accurate and anonymized mobile data for people counts, activity and movement with 100% coverage in most cities. Instant-on dashboard with preloaded data, preloaded shapes, drawing tools, and easy API integration for IoT grids and sensors. Claim your city, discover deep insights, make an impact. Start your 30-day free trial. Pay as you go with no upfront commitment. GeoX AI analyzes anonymized data from +200 million mobile devices and +20 billion monthly data points to infer real-world behaviors and visits to places, brands and businesses, without accessing any personally identifiable information. The self-serve visual dashboard is updated continuously to publish insights and audience segments that can be activated through social and programmatic channels. GeoX AI is an essential service for marketers, advertisers, retailers, local businesses, consulting, academia and research organizations. Premium mobile audience segments from confirmed visits to places, businesses and events, discovered through machine learning. Brand affinity, visit frequency, time series and competitive analysis for +2000 brands across 75 core categories at a global scale. Self-serve analytics and insights for mobile marketers with easy API access for programmatic integration through activation partners. Sign up for a free account, search and discover insights, access premium audience data. Pay as you go with no upfront commitment. 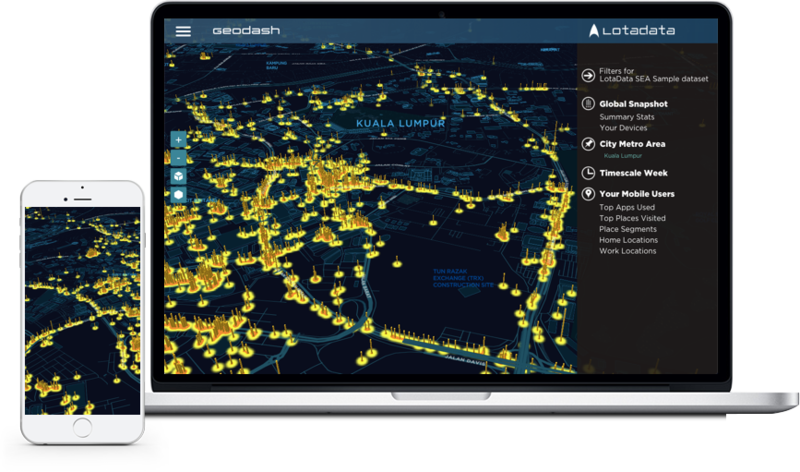 GeoDash Analytics Preview How does LotaData use AI to generate user profiles and accurate geo-segments ? Fill out the form for a demo. GeoDash AI analyzes the raw data exhaust from mobile apps, infers movement patterns, constructs profiles and cohorts based on real-world behaviors, without accessing any personally identifiable information about the consumer user. The lightweight and energy efficient SDK judiciously collects location signals from mobile apps at relevant moments, with explicit notice and consent. GeoDash AI is an essential service for app developers, publishers and enterprise customers for uncovering actionable insights about mobile users. Full consumer journey with places visited, brand affinity, dwell time, visit frequency, time series, and behavioral predictions. Thousands of monetizable geo-segments from daily commuters and yoga enthusiasts to pet owners and fast food lovers. 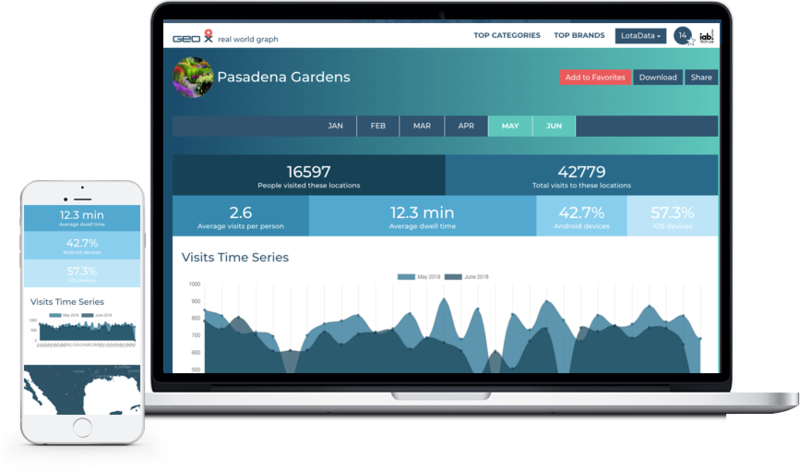 Spectacular dashboard with real-time data, geo-filters, API access and batch data feeds for user profiles and geo-behavioral insights. Integrate the free SDK in your apps. Analyze and visualize user data for free. Locate, engage and convert your mobile users. CityDash Analytics Preview Why are government leaders adopting CityDash analytics powered by LotaData ? Fill out the form for a demo. LotaData's self-serve platform solves practical problems for customers across industry verticals. We work with mobile marketers, app developers, telcos, government agencies, and enterprise businesses. With state-of-the-art machine learning and AI, we are singularly focused on uncovering the ground truth. "Movement analytics and people counts for parks, playgrounds, gardens and parking spaces." "People insights and movement patterns for all our mobile apps across major cities in Thailand." "Data insights for quantitative research about the mobile apps ecosystem." "Raw geo-signals translated into profiles, segments and insights, at global scale." 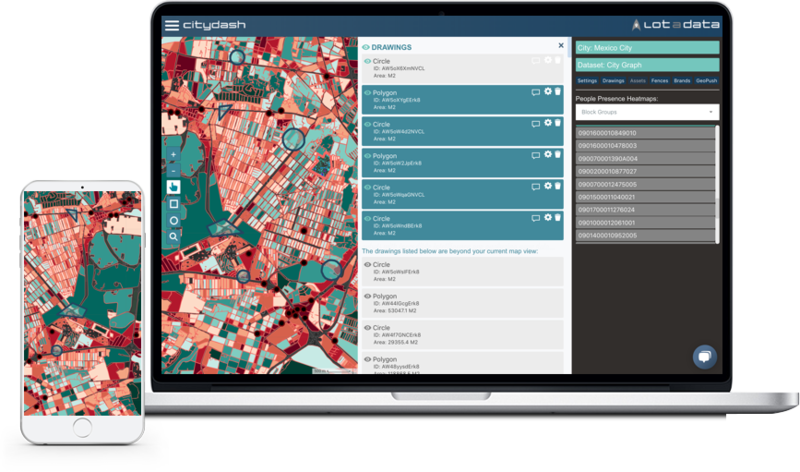 "Data-driven optimization for city facilities, programs, 311 issues, and crime reports." "Precise segments for targeted campaigns and engagement based on mobile geo-behaviors"
"Demographics, neighborhood profiles, cost of living indices, from a single source." Thousands of smart leaders have subscribed to LotaData’s knowledge base and monthly updates. You should too.